T80 UV/VIS Spectrophotometer - Oasis Scientific Inc. Double Beam optical system with fixed bandwidth. 190-1100 nm. protocol, data export to Word or Excel, multi-user management, etc. Cover, Operation Manual, Calibration and System Documentation. · CE Marked, ISO Compliant. The PG T80 UV/VIS is a high performance double beam UV Visible automatic scanning spectrophotometer with a fixed 2nm bandwidth. The instrument covers a wavelength range of 190-1100nm and comes with a built-in 8-position motorized cell holder as standard. T80 UV/VIS has excellent baseline stability and high resolution. With a large 'fold away' LCD display allowing complete display of spectra, and a large easy to use positive touch keypad, the T80 UV/VIS can be operated in “stand alone” mode without a PC. 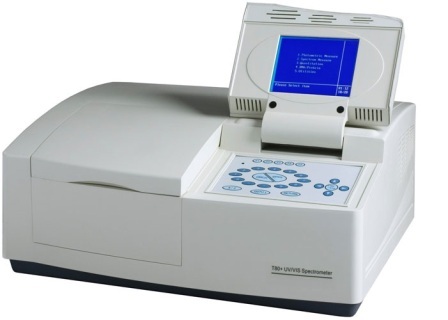 The main unit of the spectrophotometer can perform photometric measurement, quantitative measurement, spectrum scan, DNA/Protein analysis and can print data. When interfaced to a PC the included UVWin 5 software offers many additional functions such as kinetics measurement, access to data base, 3D spectrum analysis, GLP laboratory protocol, data export to Word or Excel, multi-user management, etc. The T80 UV/VIS is a universally accepted and well documented technique, offers high performance, ease of use and reliability. It can be used extensively for qualitative and quantitative analysis in applications including the analysis of foods, drugs, pesticide residues, agricultural products and is widely used in the medical care, public health, environmental protection, lifescience and many other organic and biochemical applications.